Next week is the Consumer Electronics Show in Las Vegas, and accessory makers are already releasing details of new products they'll unveil at the annual gathering. This week's roundup of new iOS accessories features a number of CES-preview products that have caught our eyes. Bracketron: If you want to power up your iOS device in an environmentally responsible way, Bracketron will be introducing its GreenZero line of chargers at CES. The devices, which will range in price from $22 to $30, automatically shut off when your iPhone or iPad is fully charged. Two models include a charging cable for iOS devices that features Apple's 30-pin dock connector; all models also provide compatibility with any mobile device that charges via USB. iLuv: CES will also see the unveiling of the $30 SmashBox Pro, a protective case for your iPhone or iPod touch that includes speakers for better headphone-free listening. The SmashBox Pro operates on two AA batteries and includes external buttons for operating your iOS device; it also features a microphone for speakerphone capability. A carabiner clip lets you attach the case to your belt, backpack, or bicycle. Gavio: This vendor offers some accessories that might make you hungry. Gavio's Toast is an iPhone-docking speaker system that resembles a particularly stylish toaster. The Pill is a similar speaker system, this one specifically for your iPod nano, that looks like, well, a pill. Both products will soon be available for pre-order. Memorex: The venerable audio company has a whole line of products to show off at CES. The $70 App-Enhanced Portable Stereo Speaker, $60 Ultra-Portable Stereo Speaker, and $60 Ultra-Portable Travel Speaker for docking your iPhone or iPod touch; and the $20 Easy Listening In-Ear Earphones, $25 Phone Control Earphones, and $50 In-Ear Headphones for use with any iOS device (though the Phone Control Earphones are targeted at the iPhone). The lineup of gear will be available in stores this spring. 60 Beat: The $50 GamePad game controller hearkens back to the good old days of game playing—at the turn of the 21st century. The GamePad plugs into your iPhone or iPad's headphone jack (not its dock-connector port), and lets you control games with dual analog joysticks and a D-pad, along with 10 other action buttons. No batteries are required. Deckster: This Canadian company is the latest to see the wrist-adorning possibilities of the iPod nano, but it does so with a recycling twist. Deckster's Re:Class wristband, which turns the nano into a watch, is made from various reused and recycled materials, including backpack textile and bicycle-tire inner tubes. The nano itself is encased in a stylish centerpiece. Each of the various Re:Class models costs Canadian $165. Disney: Disney fans will surely appreciate the company's partnership with longtime iOS-accessory vendor iHome. Among the highlights are a $50 Kermit the Frog or Minnie Mouse alarm clock dock. 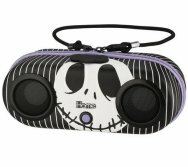 There's also a $40 Nightmare Before Christmas water-resistant speaker system, and an assortment of earbud models. Best of all? You don't have to be a kid to buy or enjoy these products. Edifier: For many of us, the iPhone has replaced our alarm clock. The $80 Tick Tock Dock looks just like an old alarm clock—but with your iPhone as the clock's face. 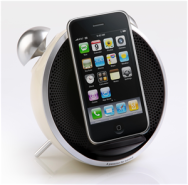 The Tick Tock Dock includes speakers for listening to iPhone audio, along with a built-in FM radio for those times you want to listen to something besides your iPhone's audio. The Tick Tock Dock comes in black, white, "60s white," or pink. Korg: Musicians who like to keep it small can do so with Korg's $90 Monotron, a pocket-sized synthesizer that plugs into your iPhone or iPad and lets you create, mix, and edit songs using its various knobs and switches. Best of all, it's small enough to toss in your bag for stripped-down melody-making.